Cheer on José Bautista and the rest of the Blue Jays this summer at the Rogers Centre. The Toronto Blue Jays are arguably the hottest sporting ticket in town, and everyone wants to jump on the bandwagon early this year to root for 2015’s AL East champions. Don’t miss the star-studded lineup at the Rogers Centre, which includes José Bautista, Josh Donaldson, Edwin Encarnacion and Marcus Stroman. The city’s major league soccer team, the Toronto FC, and the Canadian Football League’s Toronto Argonauts, both call BMO Field home. Though the TFC have been playing here since 2007, this is the Argos’ inaugural season. Italian forward Sebastian Giovinco is the one to watch when the TFC play on the pitch; last year he won the MLS Golden Boot, making him the first TFC player to hold the honour. The Argos welcome back quarterback Ricky Ray, who sat out most of the 2015 season due to a torn labrum, while kicker Lirim Hajrullahu is new to the roster. If you’re counting down the days to when the puck drops, then head to the Hockey Hall of Fame, which pays tribute to Canada’s game. The coveted Stanley Cup is here, as is a replica of the Montreal Canadiens dressing room. Interactive exhibits let you be part of the action, like a shoot-out against a computer-simulated version of Jonathan Bernier or calling the action on classic games in the TSN/RDS Broadcast Pods. EAT Hockey fanatics won’t want to miss surrounding themselves with The Great One’s personal memorabilia at Wayne Gretzky’s The namesake restaurant of the former Edmonton Oilers player is a casual spot for burgers, pizza, poutine, and family favourites like Grandma Gretzky’s meatloaf. Can’t get tickets to the game but don’t want to miss any of the action? Real Sports Bar & Grill doesn’t disappoint with its 39-foot-long big screen and 199 additional televisions. Nachos, burgers, ribs and wings—choose from 10 different sauces including suicide and spicy jerk—can all be washed down with more than 126 beers on tap. Not to be outdone, Shark Club at Yonge-Dundas Square boasts a 15-foot big screen, 57 TVs and a 90-foot sports ticker with menu offerings like the double-fisted burger. Whether or not they’re deserving of the attention, the Toronto Maple Leafs are inevitably the talk of this town as soon as the weather begins to cool. But there’s a decidedly different atmosphere surrounding the Blue and White’s upcoming season. Following years of subpar returns from highly paid players who never quite seemed to coalesce, the Leafs seem to have accepted their fate and entered rebuilding mode. Stalwarts like Dion Phaneuf and Joffrey Lupul anchor an otherwise unremarkable lineup; it’ll be reasonably competitive, but few fans are expecting the team to contend this season. Local puckheads instead have their sights set on the future: team president (and hall of fame player) Brendan Shanahan has brought on marquee hockey minds, including GM Lou Lamoriello and head coach Mike Babcock, to mold the squad in their image, a job facilitated by a preponderance of future draft picks, and, ideally, the continued development of young contributors such as Nazem Kadri, Morgan Reilly and James van Riemsdyk. The annual Planet in Focus Film Festival continues to shine a spotlight on environmental issues that impact the world’s health and humanity’s very existence. In a special event tonight, the festival presents a conversation with award-winning filmmakers and artists Jennifer Baichwal, Edward Burtynsky and Nicholas de Pencier. Listen to the music, minute by minute, as American rock legends The Doobie Brothers perform their classic hits tonight at historic Massey Hall. The world’s premier whisky tasting event, Whisky Live is open to the public this weekend at the Metro Toronto Convention Centre. It’s your best chance to sample from many excellent, soul-warming spirits while attending educational masterclasses and mingling with top distillers. Make sure to bring some breath mints when you visit the Evergreen Brick Works. You’re going to need them, as this weekend the venue hosts the Toronto Garlic Festival. Fun for the whole family, this uniquely flavoured expo offers everything you could possibly want to know about garlic, including its health benefits, how and where it’s grown in Ontario, as well a chance to try top chef garlic-inspired recipes. There’s also a “Strongest Garlic Breath” contest, naturally. Peruse literary classics—and perhaps pick up a rare first edition or two—at the Toronto International Antiquarian Book Fair, where readers of all stripes can share in their love of history and the printed word. It’s once again time to indulge your sweet tooth—the Toronto Chocolate Festival is back! Starting this weekend, the city-wide event features Toronto’s finest chocolatiers, who are all eager to showcase the limitless gourmet possibilities of premium cocoa products. Music lovers, you’ve got two exceptional concert opportunities this evening. At the Sound Academy, chart-topping British electro-pop singer Ellie Goulding belts out tunes from her just-released sophomore record, Halcyon, while Canadian prog-rock icons Rush charge into the Air Canada Centre with more than two decades of hits. Take that hobby of yours to the next level at a trade show that’s as enjoyable as it is educational. The Creativ Festival is not only Canada’s largest marketplace dedicated to sewing, knitting, quilting, beading, needlework, scrapbooking, decorating, crafting, textile arts and more, it also offers a number of informative seminars and workshops to help you improve your DIY credentials. Catch all the pigskin action as hometown favourites the Toronto Argonauts renew their rivalry with the Montreal Alouettes. By attending the game, you’ll also be helping tackle a cancer, as proceeds from the game go to support the Canadian Breast Cancer Foundation. ON NOW The Canadian Football League’s 100th Grey Cup is scheduled to be played November 25 in Toronto, and our own Toronto Argonauts have no intention of disappointing their fans by missing out on the push to the postseason. 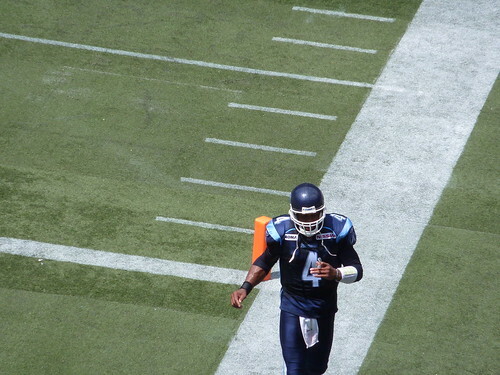 Newly acquired quarterback Ricky Ray, along with running back Cory Boyd, has given the boys in double-blue a fresh winning outlook, which is put to the test in two home games this month. August 6 sees the squad kick off against the B.C. Lions, while on August 27, Ray goes up against his former team, the Edmonton Eskimos. Rogers Centre, $28.25 to $91.50; call 1-855-462-7467 or visit here to buy. Watch Chad Owens as he tries to become the first player in pro football history to rack up 3,000 combined yards in back-to-back seasons when the Toronto Argonauts take on the Calgary Stampeders at the Rogers Centre. Hear the sweet stringed sounds of Sinfonia Toronto at their first Masterpiece Concert of the new season at the Glenn Gould Studio. The virtuoso chamber orchestra welcomes pianist Davis Jalbert and trumpeter Guy Few for the show. Marvel at the strange and beautiful creations of costume designers at the TIFF Bell Lightbox’s Canadian Film Gallery, where the exhibition Otherworldly: The Art of Canadian Costume Design opens today, with attire from Splice, The Thing, The Imaginarium of Doctor Parnassus and other films on display. Nod your head to the beat and revel in the rhymes as k-os brings his unique blend of rap ‘n’ roll to the CNE Bandshell at Exhibition Place. Cheer on the Flyin’ Hawaiian Chad Owens at the Rogers Centre—he’ll be looking to run back a kick or two for the Toronto Argonauts when they take on the BC Lions in week 10 Canadian Football League action. Brace your taste buds for the Hot and Spicy Food Festival. Head down to the Harbourfront Centre to feast on fiery fare from around the world. Music, film, dance, and cooking demos are all on the menu. Support the ongoing earthquake and tsunami relief effort in Japan at the Concert for Japan at Downsview Park. FTISLAND, Vas Vega, traditional Japanese drummers and others perform. Dress up as your favourite Japanese anime character for a chance to win $1,000. Cool evening breezes and Shakespearean comedy await you at the Canadian Stage TD Dream in High Park. This outdoor performance of The Winter’s Tale comes complete with fairytales, shipwrecks, romantic misunderstandings and an original music score. Sunday: There's more than the existing public sculptures to see during the Distillery District's artisan fair. Art spills onto the streets of The Distillery Historic District. Artisans at the Distillery features local artists showcasing their paintings, sculptures, pottery and more. Get down at The Guvernment as a cast of all-star DJs rock the Labour of Love Festival. House and electro icon Benny Benassi will spin the records along with rising star Avicii and others. Hispanic food, folklore and fancy footwork take over Mel Lastman Square in North Toronto for the Hispanic Fiesta. Colourful culture from 20 Spanish-speaking countries will be on display, with over 300 local, national and international performers taking part. When you’ve had your fill of doughnut cheeseburgers and fried cola at The Ex, sit back, look up, and gaze at the Canadian International Air Show. Jet fighters, vintage aircraft, and the famed Snowbirds roar above Exhibition Place. Samba at Yonge-Dundas Square and enjoy the best of Brazil. The Brazilian Day Canada Festival features a street fair, music, food, dancing and a performance by popular samba group Exaltasamba. See the strength and solidarity of workers on display at the Labour Day Parade. The parade begins at Queen Street and University Avenue and marches to the Dufferin Gates at Exhibition Place. Get a taste of exotic art, culture and entertainment at the Harbourfront Centre this weekend with the Tigran Iranian Festival. Explore the concept of “Visions of Eternity” through the work of participating artists and writers, and take in live music from the Paradis Orchestra, Rana Farhan, and the Iranian National Choir. Toronto’s Caribbean Carnival is more than just a parade—celebrate the salacious sights, sounds and flavours of the Caribbean with an elegant night at the event’s Gala. Dress your best for a night of masquerade models, music and exotic food at the elegant Liberty Grand. “Do It Again” while “Reelin’ In The Years” when Steely Dan hits the stage at the Molson Amphitheater. The American jazz band still has a commanding stage presence with a slew of hits to play, including “My Old School” and “Rikki Don’t Lose That Number”. They’re shocking, comedic, and blue—catch the Blue Man Group when they electrify the Princess of Wales Theatre tonight. The multi-media performance with the bald blue men is centered on a large LED curtain and high-resolution screen for a unique theatrical performance. After starting their regular season on the road, the Toronto Argonauts finally return to the Rogers Centre for their first game of the season. Cheer on the Boatmen as they take on the Winnipeg Blue Bombers looking for a win in front of a home crowd. Cool down with the sound of the soothing melodies of the Forgotten Romantics at Walter Hall as the Toronto Summer Music Festival continues. The Vienna Piano Trio teams up with Canada’s leading chamber musicians to perform The Suite by Moszkowski, the masterful sextet by Louis Spohr, and the piano quintet by Karl Goldmark. 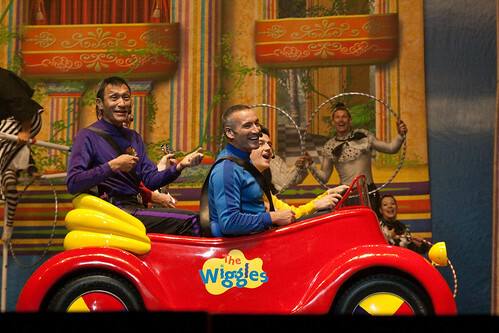 Wiggle on down to the Ricoh Colliseum to join in on The Wiggles’ Big Birthday Tour. The 20th birthday celebration will be packed with action including the four Wiggles, Captain Feathersword, Dorothy the Dinosaur, Henry the Octopus, and Wags the Dog. Celebrate over 500 artists at Yonge-Dundas Square this Sunday for a day filled with high-spirited performances and art on display for Youth Day 2011. The square will be filled with inspiring music, dance, art, photography, food, and vendors to keep you entertained all day long. The Big On Bloor Street festival continues on Sunday with stores along the Dufferin and Lansdowne stretch offering special in-store events, sales and menus. Have a taste of the diverse art, culture, and food that this neighbourhood has to offer. Take advantage of Toronto’s summer festival season before it passes you by! The annual After Dark Film Festival begins today, Friday the 13th! The Bloor Cinema (a local landmark) features a week of new and independent horror, sci-fi, action and cult films from around the world. Favoured by none other than Quentin Tarantino, this film festival is one of Toronto’s can’t-miss events. True to the marketers’ words, you can “touch the puck that touched a nation” this weekend at the Hockey Hall of Fame. That puck, which Sidney Crosby shot past U.S. goalie Ryan Miller to end the 2010 Olympic hockey tournament, is now on display at the Hall’s Double Gold exhibit, which celebrates victories by both the men’s and women’s teams. Visitors can also stand in awe of Crosby’s stick and gloves, coach Mike Babcock’s lucky tie, and Hayley Wickenheiser’s jersey. Start your weekend right by partaking in the first night of the Hot and Spicy Food Festival, part of the Harbourfront Centre’s World Routes slate of festivals. Tour the Red Hot Marketplace and taste spicy marinades, sauces, and dips (if you dare) and sample top chef Jamie Kennedy’s spiced frites. Then head to the stage to hear some sizzling international music! Toronto’s historic Casa Loma hosts “A Clue to Murder” tonight! A riff on the classic board game, this dramatic murder mystery unfolds while you wine and dine. As the meal draws to a close, guests sift through the clues to guess the murderer, weapon, and room in which the mischief occurred. Miss Scarlet, in the library, with the candlestick, anyone? India Day celebrations kick off with a parade down Yonge Street this morning, in honour of the country’s independence. Follow the floats to Yonge-Dundas Square, which hosts multiple cultural events and activities throughout the day! Sample Indian cuisine, buy local crafts, get a henna tattoo and enjoy live entertainment! Cheer on the Toronto Argonauts as continue a fierce rivalry with the Montreal Alouettes. Off to a (surprisingly) strong start this season, the Argos hope to maintain their winning ways at the Rogers Centre. Make your weekend a little greener! Learn about (and sample) sustainable cuisine at the Conscious Food Festival. Chat with local farmers, try Ontario wines, chow down on a grass-fed beef burger or artisan ice cream, and view chef and farmer demonstrations. Don’t forget to bring your own reusable bag if you’re planning to shop! 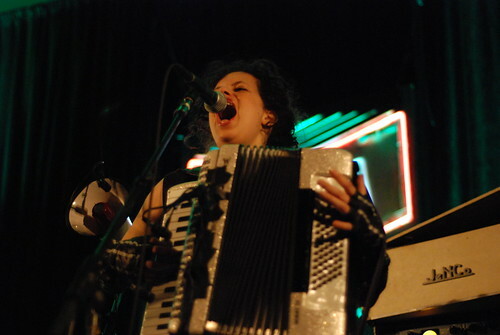 Catch one of the Western world’s hottest music groups, as Arcade Fire storms the stage tonight on the Toronto Islands! The Montreal-based band is set to perform songs from their newest critically acclaimed album, The Suburbs. Hip hop/R&B maverick Janelle Monae opens. Sunday: Will Andy Murray amongst the Rogers Cup finalists? See the stars of men’s tennis battle at the Rogers Cup final today! With a multimillion-dollar prize and bragging rights heading into the U.S. Open on the line, its sure to be an exciting match. It’s the final day of the SummerWorks Theatre Festival! This indie theatre expo gives emerging Canadian talent the chance to be seen. With plays showing all day, all over Toronto, nothing should keep you from being in the audience. Another last chance: Catch the Bard’s Bus Tour, a travelling theatre troupe that’s set to perform Shakespeare’s Twelfth Night outside at Todmorden Mills this evening. This comedy of mistaken identity is sure to keep you laughing! Cheer your favourite horse to victory in the Breeders’ Stakes. The final race in this year’s Canadian Triple Crown is a 1.5-mile turf derby run this afternoon at Woodbine Racetrack. This weekend kicks off a couple of annual Toronto traditions—the Luminato arts festival, as well as the start of a new Argonauts football season. In between, you can pull up a chair, order a pint and roar for your favourite side while watching the FIFA World Cup. Gather your sports buddies and crowd into the bustling Football Factory to catch the much-anticipated opening matches of the 2010 FIFA World Cup. Catch Canadian Idol’s Sass Jordan and R&B singer Melanie Fiona at Yonge-Dundas Square for Luminato First Night. This free showcase of pop-music divas is the first of many events comprising the Luminato Festival. Get in line early for one of two last-minute chances (today and Saturday) to see Montreal-based mega-band Arcade Fire rock The Music Hall with old favourites and new tunes from their upcoming album, The Suburbs. You’re almost certain to shiver as John Malkovich takes to the stage as Jack Unterweger, a real-life serial killer-turned-literary celebrity, in Luminato’s The Infernal Comedy: Confessions of a Serial Killer. Enjoy the penultimate day of performances for Fiddler on the Roof, the feel-good story of humble Tevye (portrayed by Broadway star Harvey Fierstein), who strives to protect his family’s traditions despite the allure of outside influences. Who let the dogs out? And what about their owners? This weekend, the St. Lawrence Market neighbourhood goes canine for Woofstock, North America’s largest outdoor festival for dogs. Check out the pooch couture fashion show and many other fun events. Cheer on the Toronto Argonauts—this city’s CFL football team—as they battle provincial rivals the Hamilton Tiger-Cats in pre-season action this afternoon at the Rogers Centre. Don’t miss your last opportunity to applaud the National Ballet of Canada’s West Side Story Suite, which features musical and dance highlights from the timeless love story. The production is complemented by Jerome Robbins’ Opus 19/Dreamer and Pur ti Miro, a world-premiere by Finnish choreographer Jorma Elo. Help make hunger history at the Royal Ontario Museum, where a $250 ticket helps Second Harvest feed those in need—and also nets you an exquisite meal. Toronto Taste unites 60 of the city’s top chefs and 25 beverage providers for an evening of epicurean delights.